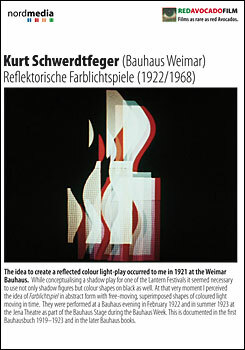 Though the Bauhaus wasn’t directly involved in all art forms, it definitely exerted interesting impulses nevertheless. 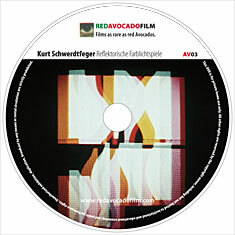 A particular point in case is Kurt Schwerdtfeger’s 1922 Reflektorische Farblichtspiele [Reflecting Colour-Light-Play]. Originally conceived as a play for one of the famous Bauhaus Lantern Festivals, it premiered at the Kandinsky home and kind of revolutionised the spatial aspect of 20th century sculpture. At the same time it equals the German abstract films of the early 1920s and is a predecessor of performance art, light shows and expanded cinema. Consequently, the Play was re-discovered and re-staged in the 1960s and has been in demand ever since. This DVD for the first time includes both the re-staged 1966 performance (no recordings of the 1922/23 ones exist) and a short documentary about the apparatus used for the Play. One of Schwerdtfeger’s predicaments for his full acceptance into art history’s “Hall of Fame” to this day is the fact that Ludwig Hirschfeld-Mack, also a Bauhaus student, staged a similar Play that for several reasons overshadowed Schwerdtfeger’s pioneering achievements early on. Still today even serious Bauhaus publications omit Schwerdtfeger altogether or at least diminish his merits by denouncing him a collaborator to Hirschfeld-Mack – in all likelihood by simply copying older writings without doing own research. In 1964 Schwerdtfeger stated in a letter “A couple of weeks before the Bauhaus Week [1923, one year after his own premiere], Hirschfeld-Mack grouped with some Bauhaus students and developed his play. I was refused access to these. Rehearsals went very secretively. At a ball during the Bauhaus Week the group premiered their version. The involvement of several people made it more complex than mine. That’s when I left the Bauhaus because I felt deceived.” Even skeptics will have to admit, though, that the official first Bauhaus Book, covering the years 1919 – 1922, contains two pictures of Schwerdtfeger’s Play and none of Hirschfeld-Mack’s as the latter’s didn’t exist as yet. After Schwerdtfeger left the Bauhaus, based on his high merits as a student he was immediately appointed Professor for Sculpture at the Stettin Academy. Unable to exhibit during the Nazi years, he educated budding teachers in the arts in Alfeld/Hildesheim until his death in 1966, just days before the re-staging of his Play at the Hannover Arts Society. Please, note that henceforth we won’t honour orders for private use DVDs if paid by an institution or with institutional delivery address. If in doubt get in touch with us – we are not in it for the money but because we are passionate about these films!